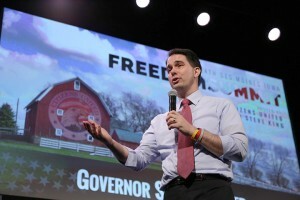 Republican presidential candidate Wisconsin Gov. Scott Walker will travel to Iowa this week for several stops in the western region of the state in the “Walker Winnebago.” Like several other GOP contenders, Walker plans to complete a “full Grassley” by visiting all 99 Iowa counties; his upcoming swing will bring his total to 25. The following are the stops where media have been invited. The Walker campaign doesn’t typically announce all of its stops.